1 Find A Grave, (accessed 03/01/2016). 2 Iowa, County Marriages, 1838-1934, Marriage record for H. A. Wallace and Ilo Browne, FamilySearch.org (Online Database). 3 Cantwell, Edward Norton, The Generation of the Upright: William Cantwell, 1776-1858, Nancy Ann Williams, 1779-1850, Lyons, Iowa: Press of William B. Farver (1911), 40, Google Books (Digital Library). 4 Roberts, Gary Boyd, "#53 Royal Descents, Notable Kin, and Printed Sources: Major Historical Figures Descended from Anne (Lloyd) (Yale) . . .", (accessed 12/13/2016), New England Historic Genealogical Society (Online Database). 5 Roberts, Gary Boyd and William Addams Reitwiesner, American Ancestors and Cousins of The Princess of Wales, Baltimore: Genealogical Publishing Co., Inc. (1984), 69, Ancestry.com (Online Database). 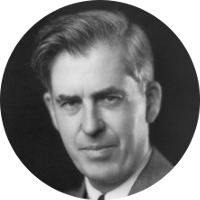 6 Wikipedia, "Henry A. Wallace", (accessed 02/29/2016).